The 250 years covered by Silver, Trade, and War marked the era of commercial capitalism, that bridge between late medieval and modern times. Spain, peripheral to western Europe in 1500, produced American treasure in silver, which Spanish convoys bore from Portobelo and Veracruz on the Carribbean coast across the Atlantic to Spain in exchange for European goods shipped from Sevilla (later, Cadiz). Spanish colonialism, the authors suggest, was the cutting edge of the early global economy. America's silver permitted Spain to graft early capitalistic elements onto its late medieval structures, reinforcing its patrimonialism and dynasticism. 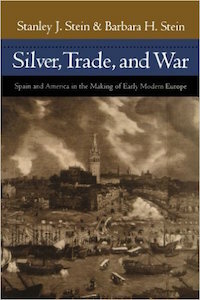 However, the authors argue, silver gave Spain an illusion of wealth, security, and hegemony, while its system of "managed" transatlantic trade failed to monitor silver flows that were beyond the control of government officials. While Spain's intervention buttressed Hapsburg efforts at hegemony in Europe, it induced the formation of protonationalist state formations, notably in England and France. The treaty of Utrecht (1714) emphasized the lag between developing England and France, and stagnating Spain, and the persistence of Spain's late medieval structures. These were basic elements of what the authors term Spain's Hapsburg "legacy." Over the first half of the eighteenth century, Spain under the Bourbons tried to contain expansionist France and England in the Caribbean and to formulate and implement policies competitors seemed to apply successfully to their overseas possessions, namely, a colonial compact. Spain's policy planners (proyectistas) scanned abroad for models of modernization adaptable to Spain and its American colonies without risking institutional change. The second part of the book, "Toward a Spanish-Bourbon Paradigm," analyzes the projectors' works and their minimal impact in the context of the changing Atlantic scene until 1759. By then, despite its efforts, Spain could no longer compete successfully with England and France in the international economy. Throughout the book a colonial rather than metropolitan prism informs the authors' interpretation of the major themes examined.